How many times has this man claimed to have “proof” of something only to never produce it? Where are those Comey tapes? Trump was forced to call those soldiers families. The press questioned him on why he hadn’t contacted them, and in his typical fashion, he lied – saying President Obama and President Bush didn’t reach out to Gold Star families. When countered on that big, fat lie he did his usual deflection, “I don’t know, but that’s what I heard.” Sweet mercy! But the point is, Trump was forced to call the soldiers’ families, and we all know how Trump acts out when forced to do something he doesn’t want to do. We also know he is 100% incapable of feigning (let alone actually feeling) empathy and compassion. Meanwhile, with that stunning tweet, Trump has put a grieving widow in the center of the upcoming twitter war. He has put her in a position where all eyes turn towards her, awaiting her response. He has no decency. Sad. Even by Trump standards this is the lowest of the low, and if he had proof he would produce it immediately. Good demonstration of Trump’s sociopathic tendencies and hateful nature. Dare say the widow will suffer the slings and arrows of the evil curse we call the far right, dare say she’ll handle it far better than Trump ever could. If Trump, Obama and the Washington Post’s Phil Rucker really cared, the us army would’nt be in Niger, and she would’nt be a widow. Not that we needed to see your sociopathic tendencies on display today. This pretty much highlights the extremely cynical use the Right makes of the military. They’ll fetishize everything about military service until they have to face the real price of service. They spent millions pretending to look into what happened in Benghazi and are working very hard at ignoring this event. No investigations to what happened, no assessments as to why they were there, no evaluations of what could have been done better. And so far the news reports of this mission are not flattering. The GOP doesn’t care about the military — they care about whatever politics they can get out of them and how much of your money they can send to the contractor community. Swap out the nouns and this sentence serves as a universal statement of GOP principles. “Rep. 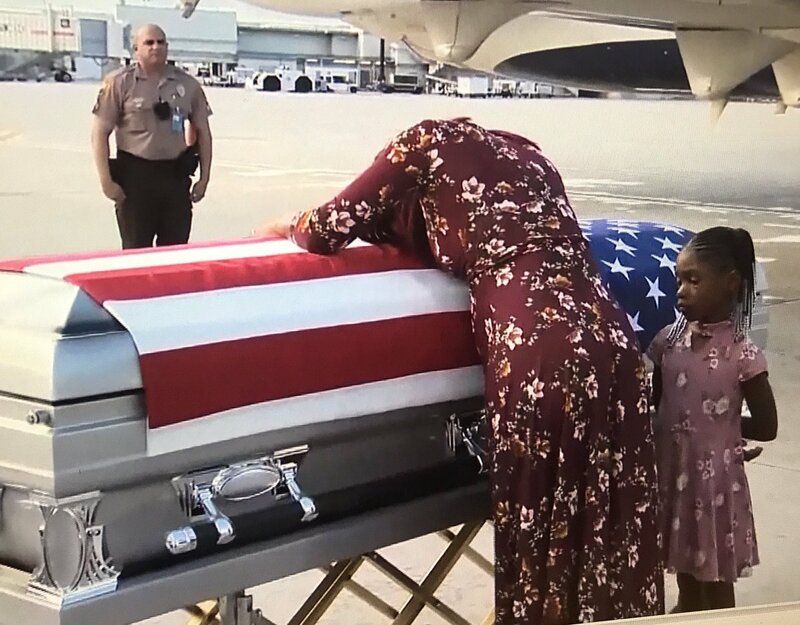 Wilson told CNN that Johnson’s widow said Trump did not know her fallen husband’s name. Of course he didn’t know his name. He wasn’t a human being valuable to GRIFTUS. For the entire (bad) reality TV performance of this fool, he couldn’t even play act a few minutes of consolation or appreciation. Sheesh, you’d think someone would have written him a script. At least have written down the names. “A reporter then asked Trump about the “proof” he claimed to have that Wilson is lying in a tweet earlier Wednesday. So vile. Also, whenever he makes these threats he’s always lying about proof. I have proof President Obama wiretapped me! I have tapes that prove Comey’s lying! I have proof the women who accused me of sexual harassment/assault are lying!